Come aboard the "Gettin' Lucky" and Experience The Best In Offshore Sportfishing. 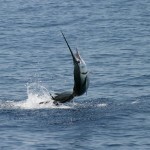 Exciting Sportfishing For Dolphin, Sailfish, Kingfish, Wahoo and Much More! Let's Go Kite Fishing and Fly Goggle Eyes Off The Edge For A Florida Sailfish. 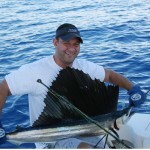 Some Of The Best Deep Sea Fishing In South Florida is Here in The Palm Beaches. Book Your Sportfishing Adventure Today! Welcome aboard Gettin’ Lucky Sportfishing Jupiter Fishing Charters! We are a professional and fully-licensed sportfishing charter service located in Jupiter, Florida – the Sailfish Capital of the World! Specializing in Jupiter Fishing Charters. Let us show you the best fishing that the Palm Beach County, Florida area can offer and put you on the fish of a lifetime. We specialize in offshore sailfish trips but we also offer fishing trips ranging from stalking Snook and Tarpon in the Jupiter inlet or inshore hotspots in the Intracoastal to chasing bluewater pelagic heavyweights such as Mahi Mahi, Wahoo and Tuna. With more than 18 years of experience fishing out of Jupiter, Captain Scott Collins can put you on the fish day or night, rain or shine. Captain Scott can customize a trip that caters to everyone’s talent level from the seasoned pro looking for a light-tackle record to children eager to become anglers. Gettin’ Lucky Sportfishing charters cater to the entire family and take pride in making cherished memories that will last forever. Regardless of the time of year expect action on your Jupiter Fishing Charter. We will have the fish dialed in. Whether you’re looking to fish with family and friends or a business trip with clients or employees, Gettin’ Lucky Sportfishing can do it all. Our focus is to provide unmatched service along with an enjoyable day on the water. Please check out the rest of our website, especially the photos to book your Jupiter Fishing Charter. Pretty soon, you’ll be Gettin’ Lucky and catching the experience of a lifetime.